The only book on Financial Freedom that sheds light on your finances and will set you free. Three ways to consider money: how to create it, how to manage it and how to protect it. The goal of this book is not about earning more money: it is knowing how to treat money to obtain freedom. Everything you think you know about money is influenced by your convictions. And we are often wrongly guided by our convictions. Money doesn’t make you better or worse. It doesn’t have the power to change people. It’s only a unit of measurement. Saving your money doesn’t make any sense, because inflation consumes it. Instead learn to invest it. Achieving your financial freedom is easier than you think. Automatic wealth can be created. The only limit to achieving wealth is in your head: “if you want to change what can be seen, first you have to change what is invisible”. Money is only an amplifier of what you are. Whether you feel rich or poor is only in your mind. Money is only a result that depends upon your actions. And your actions depend upon your psychology. What are your convictions about money? Your convictions can empower you or disempower you. Common misconceptions can influence your relationship with money. They have an impact on your finances. To earn large amounts, you must become someone you have never been before. "This book is full to bursting with self-improvement strategies that will truly change your life." "This book will make you wake up, take action and improve your life and the lives of your loved ones." "Alfio's life changing techniques are packed onto every page and they will revolutionize your life." Absolutely amazing! I am very glad I attended my first technical course about Commodity Spread Trading. I am happy to have met great people! The speakers were very well prepared and were able to make us understand complicated things in a simple way. Thank you ABTG for the opportunity that you have given me! Thanks to Alfio Bardolla's courses I have met people who were able to teach me how to shape and build my financial future. Alfio Bardolla's courses have changed my point of view. By attending them, I was able to expand my financial knowledge. Alfio Bardolla's courses have allowed me to stop thinking constantly about my bank account and to be more pro-active in my plans. They gave me a push to do things I had never thought of doing. The courses I attended with Alfio were very informative. I greatly increased my knowledge and now it's up to me to try out my new skills. I'm working on psychology and my motivation related to real estate where I want to achieve spectacular results. I met Alfio on television and then I read some of his books. I expected a lot from his courses but I was astonished and learned much more than I had hoped. I want to thank Alfio for helping me discover a new world. Take control of your money or your money will take control of you. The first step to changing your financial situation is to take responsibility for your own life and act accordingly. Have you ever wondered what would happen if you stopped receiving your salary? How many months or years could you survive maintaining your current lifestyle? This book contains strategies to help you plan your future, strengthen your investment skills and generate alternative sources of income to make you financially free. 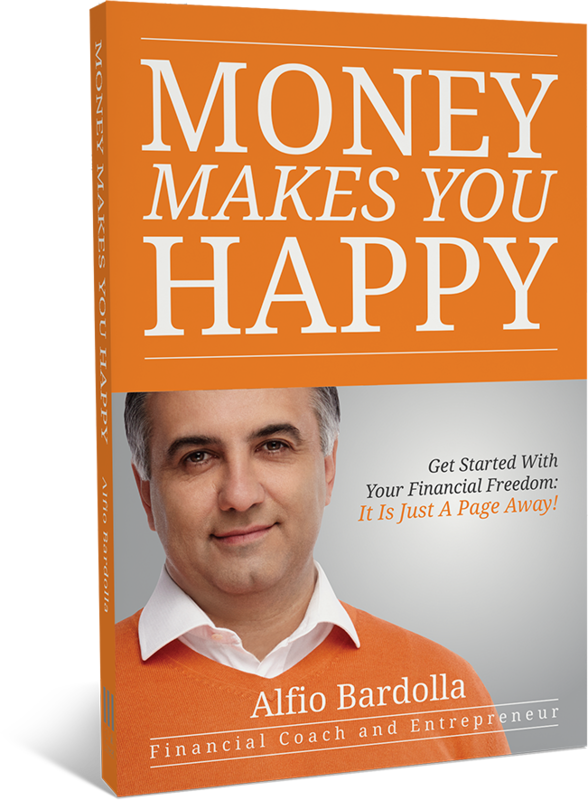 Alfio Bardolla is an entrepreneur, best-selling author of personal finance books and a financial coach. He is a point of reference for people deciding to seriously improve their financial situation. He has written six books, published by Sperling &Kupfer and Gribaudo, including "I soldi fanno la felicità" which was launched in its English translation Money Makes You Happy on October 4th. More than 300,000 copies of his best-selling books have been sold. He is the founder and master trainer of Alfio Bardolla Training Group SPA, which is the leading company in personal finance training in Europe. It has trained 30,000 people through audio programs, videos, live courses and personalized coaching. The company has over 70 employees and operates in Italy, the UK and Spain. Alfio Bardolla is also the owner and founding partner of six other companies, operating in various sectors in Italy and Europe. His accumulated wealth is estimated at around 40 million US dollars. His mission is to help as many people as possible to live their life to the fullest, through a conscious management of personal finances. In 2016, he became a member of Endeavor, a nonprofit association that aims to identify and support entrepreneurs who have the greatest potential for economic and social impact in their region. As a philanthropist, Alfio Bardolla is one of the major supporters of CharityStars and other associations which promote the dissemination of literacy in the world. © Copyright 2016 Alfio Bardolla Training Group Spa. All Rights Reserved.